RAND is a job shop specializing in manufacturing long-lasting single and nested sheaves and pulleys for the wire industry, in both standard and custom configurations. Ideal for use with clean wire, fiber optic and insulated wire products, UHMW polyethylene sheaves provide excellent abrasion, chemical, thermal and impact resistance. 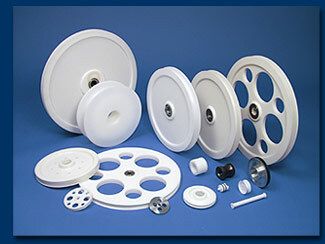 Custom sheave materials include Ceram-P, nylon, Delrin and HDPE. RAND also manufactures a full line of adjustable cable guides and deflector pulley assemblies featuring durable UHMW-PE rollers, with or without stands. © 2008 Rand Machine & Fabrication Co., Inc.